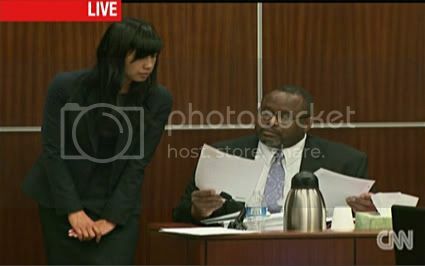 Whenever I watch Truc Do in action, I find myself wondering how this could possibly be the LA prosecutor with a spotless conviction record, who brought down Phil Spector. She's insufferable. The sound of her voice actually makes my eyes ache. I don't even know how that's possible. Do invariably makes me think of a really snotty teenager pretending to be a grown-up. I can't help wondering if this isn't some Freaky Friday, body-swap, kind of thing. Could the real Truc Do be sitting in junior high school classroom somewhere wondering how she's going to get her body and impressive law career back? I also don't know what to make of the dynamics between Do and Dr. Mosley. At times he seems like he's toying with her; even openly mocking her. At other times I think they're flirting in this really disturbing way. That too feels like some weird, teen comedy, in which the geeky, science nerd, and comic book fanboy, is awkwardly trying to get the attention of the pretty cheerleader who is way out of his league. Meanwhile, the cheerleader wants him to do her science homework so she's manipulating him with a game of come here, go away -- alternately insulting him and taunting him with casual flips of her shiny, shiny hair. One thing was clear in listening to Do's cross of Dr. Mosley. There was some sort of power struggle going on. Do's courtroom antics are always excruciating but the undercurrent of these dynamics, that clearly stem from their earlier conversations, added another layer of horribleness. And, of course, it took forever. Truc Do... you know... Never have I heard a person talk so fast for so long and say so little. I almost have to admire the artistry of it. Perhaps one day she'll be a Senator and specialize in the filibuster. I cannot tell the jury that I'm certain that organophosphates were not contributory. Do didn't care for the double negative nature of the statement but it really kind of nails it. Again, to not rule something out is not the same thing as ruling it in. It just means it couldn't be conclusively tested and excluded and no obvious observable evidence disproves it. I get the feeling that a lot of the defense's theory depends on evidence about that tenuous. And it seems like Do took those wisps of confirmation from witnesses and built her case around them. Confronted with the unwillingness of witnesses to be more decisive than that, she expends a tremendous amount of energy trying to pin them to the wall with previous statements she thought were more solid. She learned yesterday that Dr. Mosley only ever thought Dr. Paul's theories "could be" right. And worse, he's since dismissed them. Do exhibits a very obvious tell when she's confronted with witness testimony she doesn't like. Do: I understand yesterday that, perhaps I understood this, you were beginning to say that you believe today that Dr. Paul is not correct. Do: Okay. And I'm gonna talk to you about that. Translation: I'm gonna talk to you about everything but that until you beg for mercy and I twist out of you some concession to the point I expect you to make. And that is what she did, for hours on end. She did it through humiliation by pointing out in graphic detail that Dr. Paul's credentials are both broader and more impressive than Dr. Mosley's. Do: And so based upon the information that the State provided you regarding Dr. Paul's credentials, you have no reason to believe that he is not qualified, correct? Mosley: None whatsoever. I mean, Mr. Paul's credentials are impeccable. I suppose uh, you know, a thorough background check to find holes in him, in Mr. Paul's credentials, might reveal that he's allergic to kryptonite and he can't see through lead. Um, so I'm aware of that. I was aware of that when I reviewed his report. I was aware of that before as I went in to re-review Ms. Neuman's records that if I were to oppose Dr. Paul, in my opinion, that it would be essentially similar to opposing the word of God. And, so, it's not a thing I take lightly when I have an opinion that is divergent from Dr. Paul's. She did it by questioning his intellectual integrity for contradicting someone as lofty as Dr. Paul, seemingly unaware that deferring to someone, despite misgivings, is the opposite of intellectual honesty. She did it by saying frothy sputum was seen in people as they left the sweat lodge, falsely implying that these were people who were still standing and in early stages of heat exposure. Bill Hughes objected and pointed out that this misstated the record. But Dr. Mosley explained that in unconscious people who could not protect their airway, as in late stage heatstroke victims who were dragged from the sweat lodge, pulminary edema and the attendant frothy sputum were likely. I know a lot people listening to Mosley thought he was validating the defense's theory and that he was a very weak witness for the prosecution. I can't speak for how the jury heard it, and that's all that really matters, but what I heard was a witness who was openly derisive of Truc Do and who flipped her own illogic back on her repeatedly. The problem for the prosecution is only that he did so with great subtlety. Humor that dry is lost on a lot of people but he was cracking me up. Mosley did get more combative at points, like when Do threw a pile of binders in front of him and ask/told him that they were Liz Neuman's records. Do: Those are the complete medical records for Liz Neuman, correct? Mosley: ... restate the facts of the moment. You handed me four binders and asked me if these are the complete medical records of Liz Neuman. I've never seen these binders before. I can't tell you if page 5,063 is missing or not. Um, so, to, with any certainty, tell the jury that this record is complete, I cannot do that. As testament to how much time Do can waste, allow me to present a pictorial history of her description of miosis. Could there be anyone on that jury who does not know that miosis means pinpoint pupils by now? 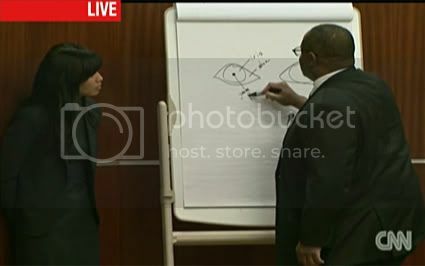 Especially given that this is not the first time Do has graphed them out on the giant easel? But she still took Dr. Mosley through this pointless exercise. To his credit, he got in another zinger. Presented with her fill in the missing pupil eye graphic, he said, "I'm gonna flip the page. I don't like your drawing." That last drawing is a comparison of a pinpoint and a dilated pupil, in case that's not screamingly obvious... which I believe it is. Do also tried to make something, once again, of the "dispute" between Dr. Mosley and Dr. Lyon regarding the heatstroke and hyperthermia diagnoses. This supposed conflict appears to lie at the heart of the Brady violation that occurred before the trial started. Dr. Lyon's colleague Dr. Mark Fischione used the unfortunate phrase, "get on the same page" in terms of making the diagnoses agree. But Dr. Mosley clarified once again that the disagreement was entirely one of semantics. And he even went so far as to say that he does think Liz Neuman died of heatstroke. He just thinks that word is the domain of clinicians, not medical examiners. I think Do was at her strongest when she handed Dr. Mosley the report of criminalist Dawn Sy on the volatiles found in tested samples. Because Dr. Mosley is, by his own admission, no chemist, he had no frame of reference for justly dismissing the report as meaningless in terms of causation. He agreed that it was a report that he would have wanted to see before rendering a final decision on Liz Neuman's cause of death and that he would have needed to confer with colleagues as to the possible toxicity of those chemical traces. I say it was strong because she really made the prosecutors look culpable in keeping valuable information from their expert. She also let him know that poison control had been contacted and that he had no idea that this information was out there, unavailable to him. She didn't mention that they never came back with a report. Do was also successful in getting that bit of background noise referring to organophosphates played in court again. She carefully used weasel words to explain that "if" the State "had found" that evidence, it would have changed the course of his investigation, would it not. His answer? Not really. Testing for organophosphates is up to the treating physicians far earlier than he would have been involved in the case. It would have been something he learned from those medical records. He also accurately described the barely audible, recorded statement as "hearsay." Bill Hughes immediately went after the hearsay recording and underscored that half of that assertion had been thoroughly discredited when carbon monoxide poisoning was ruled out. Dr. Mosley affirmed that those tests were clear and that he was confident that carbon monoxide did not play a role in Liz Neuman's death. He also asked Dr. Mosley if he was aware that the physicians treating Liz Neuman had debated whether there was evidence of a cholinergic or anticholinergic toxin at play. I think the point he was making is that they never affirmed a cholinergic toxin through testing. Organophosphates are cholinergic. Implication: Had there been clear evidence of cholinergic poisoning, it would have been thoroughly tested and the organophosphate theory would have a much more solid foundation. As it stands... not so much. I'm just not sure that came across so clearly. Dr. Mosley made it quite clear during redirect that his disagreement with Dr. Paul is that he thinks the toxidrome at play is carbon dioxide, not organophosphates. This would be wholly, rather than partly, consistent with the other findings. For example, organophosphate poisoning would result in sweating, but dry skin was what was reported in a number of cases. Lacrimation, or tearing, would also be present with organophosphates but medical reports refer to dry eyes. Mosley also referred to Sidney Spencer's report which showed no defecation, excessive salivation, or bradycardia. These three clinical observations severely undercut the organophosphate theory. 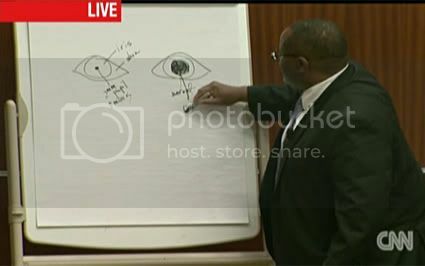 Hughes also asked Dr. Mosley if he was aware that fourteen of the victims had no evidence of pinpoint pupils. If they were all getting sick from organophosphates, they should all have exhibited miosis. Dr. Mosley also found no indication consistent with rat poison. What internal bleeding there was in Liz Neuman was from the overall systemic failure which was consistent with hyperthermia. They also discussed a bit more about dehydration. Dr. Mosley allowed that he had been too quick to dismiss dehydration referred to in the investigative report he had been given because other patients did exhibit dehydration. Liz Neuman had been hydrated in the course of her hospital care. Most tellingly, he disagreed with Dr. Lyon, and thought it was entirely plausible that the mechanical CPR administered to James Shore and Kirby Brown could have forced enough fluid into their tissues to show that they were hydrated in vitreous testing. And, he affirmed that dehydration was not a necessary component of a heatstroke death, unconsciousness, or mental derangement severe enough to make them incapable of decision making. All this talk of carbon dioxide triggered a sidebar followed by more legal wrangling and renewed calls for mistrial. Do insisted that Dr. Mosley must be referring to the Haddow email and that the prosecution is backdooring in the inculpatory information from that report. And he used the word hypercapnia! He never used that word before! That's right. A pathologist could not possibly have known the medical term for carbon dioxide poisoning unless he read it in an email from an environmental expert. This stuff hurts my brain. Bill Hughes affirmed that Dr. Mosley said that he didn't even read the Haddow email. And he reminded the court that Dr. Mosley has been talking about a carbon dioxide theory for over a year. He also read aloud the transcript of Det. Diskin's exceedingly clear explanation of a carbon dioxide co-factor. To his credit, Judge Darrow articulated clearly that the carbon dioxide information is not new at all and that the defense should have been fully aware of that line of inquiry. The defense team actually appeared chagrined and Li admitted that he and Do simply had not understood the information. Judge Darrow clarified that the part of the Haddow report that is Brady material is the connection of the carbon dioxide theory with the structure of the sweat lodge which would implicate a third party. 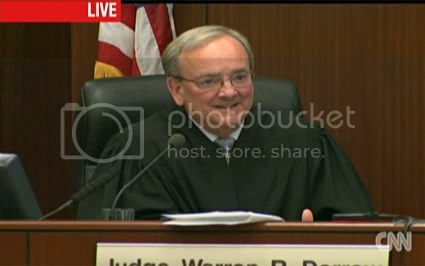 He reminded the attorneys that the mistrial motion is still under advisement and that he will take it up next Tuesday. Now here's what I find truly amazing. 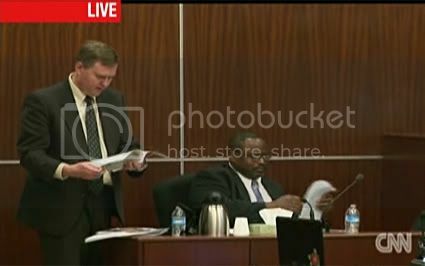 Even after all that discussion yesterday of Dr. Mosley's assertion that carbon dioxide was implicated in the sweat lodge deaths, Truc Do spent hours of cross examination without addressing it. She was so stunned that it came up again during Hughes's redirect that she demanded more cross examination questions to address the issue. Now, had she exerted a little less energy on trying to cajole Dr. Mosley into signing off on the organophosphate theory, she could have dispensed with these questions already. Rattling off her questions with the speed of an auctioneer, she asked Dr. Mosley if his finding of hypercapnia being due to poor air quality inside the sweat lodge was based on witness statements and photos of the sweat lodge structure. He explained that it was based almost entirely on witness statements. Would an airtight covering and off-center rock pit be factors in that? Well, sure. Was he aware that James Ray had nothing to do with the building of the sweat lodge? Dr. Mosley explained that he had no idea who built the sweat lodge. Do also took the opportunity to correct an assertion Mosley had made about headache not being part of the syndrome of organophosphates. She read some documentation of headache in organophosphate poisoning patients. Dr. Mosley accepted the correction with grace. The jury had some very insightful questions for Dr. Mosley. In a superhumid, closed environment, with a high level of CO2 and heat, can the body sweat properly? Short answer: No. Dr. Mosley explained the body would sweat insufficiently in those circumstances. Hyperthermia and heatstroke result when the body's mechanisms to deal with the level of heat are insufficient. And if it can't, would the body retain water and give a false level of hydration? 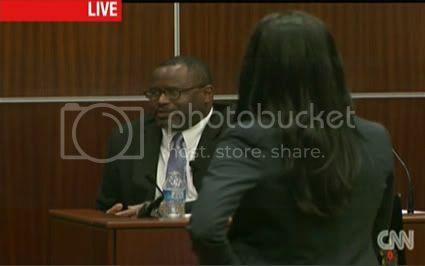 Dr. Mosley said he would not expect water retention in those circumstances. Bill Hughes asked a follow-up question; would that result in profuse sweating? Dr. Mosley said that they would. Truc Do restated Bill Hughes question with about a thousand more words but added that this should cause dehydration. Correct? Yes. If there were salivation when the person came out of the sweat lodge, could it have stopped or been cleaned away before the EMS arrived 20-25 minutes later? Bill Hughes followed up: Would Dr. Mosley expect that salivation to continue until they received medical treatment? He said he would. Truc Do... I'll try to abbreviate this... Would the amount of salivation vary based on the compound and degree of exposure and could it be as little as the foam on a latte. (That was Bill Hughes's analogy from yesterday. It may put me off lattes for life.) And yes, Dr. Mosley agreed. It could be that little. But here's my question: If the amount of salivation is relative to the degree of exposure and toxicity level, why are people who had little to no frothy sputum dead? Riddle me that, Batman. Do also asked if intubation and the placement of an oxygen mask have interfered with that salivation? He assumed that it would. Hughes followed up by asking how those medical interventions would affect salivation. Dr. Mosley said it would have to go somewhere. In the case of intubation, it might need to be suctioned. It might go back into the lungs. 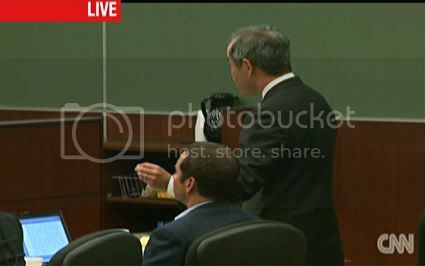 Hughes asked if such suctioning tubes would be standard EMS equipment and would it be documented in the records? Again, Bill Hughes asked if he'd seen anything in the EMS records for Liz Neuman and there was no reference to such suctioning. Truc Do followed up with Sidney Spencer's records which did show suctioning of fluid and he allowed that the description could be consistent with organophosphate poisoning. Did you autopsy Miss Neuman's brain? If so, did her brain show injury, and if so, can you explain cause and effect of this injury? 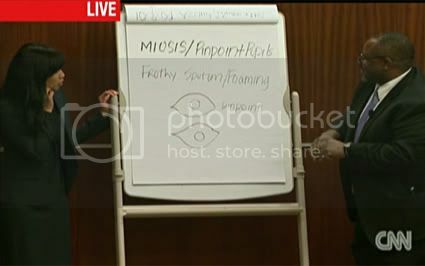 Dr. Mosley did autopsy the brain and it did not show "gross injury" but clinically, there was evidence of "anoxic brain injury." There was a lack of oxygen to the brain which may not have been readily apparent in gross examination. There could be a variety of causes of lack of blood flow to the brain. Hughes asked if she was, in fact, comatose the entire time she was at the medical center, which she was. Would anoxic brain injury be consistent with any of those SLUDGEM, organophosphate types of symptoms. He agreed that involuntary defecation would be. Miosis would, as well. Do asked if lack of oxygen to the brain necessarily meant suffocation. No. And she confirmed that it could be attributed to multiple etiologies; in other words many possible causes. I regret that I missed Mosleys zingers and corrections because I refused to listen to Dos voice. The way you write almost makes up for it. Excellent! I agree about having missed Dr. M's comebacks. For me, it wasn't Do so much as it was the doc. And, yes, your write up is fantastic! !